We are named for John Carroll, the First Bishop of the United States. He sought to build up the Catholic Church in the new nation and to highlight a particular call to civic engagement for members of the universal church. Cardinal O'Boyle, who oversaw the founding of our school in 1951, chose Carroll as our name and "pro deo et patria" as our motto. He did so at a time when there was still enough prejudice against Catholics that most Americans believed one could not be elected President. For a school on a hill overlooking the Capitol to be named after Archbishop Carroll is a reminder of what Cardinal O'Boyle saw as our purpose: to serve as a beacon for the nation of "the right conception of the nature, value and dignity of the human person." While we no longer have to demonstrate the loyalty of American Catholics in a time when the Vice President, Supreme Court justices, and many members of Congress share our faith, the educators and students at Archbishop Carroll strive still to integrate faith and civic life. We honor the vision of John Carroll and Cardinal O’Boyle through our students' activism projects, our institution's participation in the Federal Opportunity Scholarship voucher project, and frequent advocacy on Capitol Hill and with City Hall on issues that call our great nation to honor the dignity of human life. Our school's founders intended it to be a model of academic excellence. To do so they asked the Augustinian fathers to run the school, which they did until 1989. St. Augustine remains our patron saint and a reminder of the erudition to which each of our students is called. His own life as a leading intellect in Roman North Africa lacked fulfillment until he united his learning with faith in God. He founded a monastery in which monks' treatment of each other was to reflect the love God had for each of them. So it is with Augustine as our inspiration that Carroll students are asked to take on a rigorous college preparatory academic program; to use what they learn to make the world around them a better place; and to learn every day how to reflect God's love for each of them in their kindness to each other. 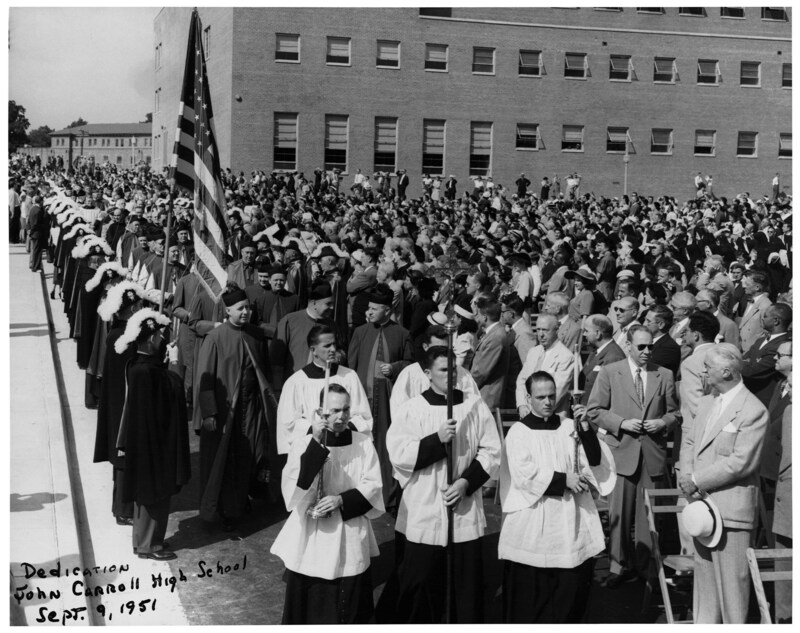 When Cardinal O'Boyle opened Carroll in 1951, he quietly ordered it to be racially integrated—one of the first D.C. schools to defy segregation, four years before the Supreme Court declared the practice unconstitutional. The standard bearers for breaking down this barrier were the Carroll basketball teams of 1958-60, who amassed a 55-game winning streak despite racist pressures from many quarters. Since that time, Carroll has had a special call to engage issues of racial and ethnic equality, and a strong commitment to the social justice teachings of the Catholic Church. That commitment was renewed in the 1980's and 90's by Robert Hoderny, a teacher who began the social justice course at Carroll and demanded that students be critical thinkers, social activists, and filled with school spirit. His spirit lives on in the Fence Party, the soup kitchen service, and the zeal for social justice inculcated in the hearts of so many Carroll graduates. In 1989, Cardinal Hickey, the Archbishop of Washington, ordered three diocesan high schools closed and merged into Carroll. He created a legacy at Carroll in three primary ways: by declaring the school coeducational at the merger; by maintaining a consistent call for Catholic institutions to serve others "not because they are Catholic, but because we are Catholic"; and by calling us to effective financial stewardship of our mission. In the two decades since the merger, Carroll has maintained and expanded the spirit of excellence, inclusiveness, service and camaraderie that have been its legacy from the beginning.